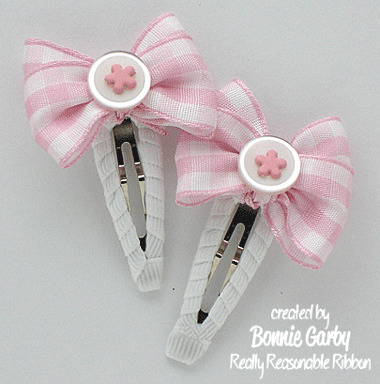 Button & Bows Challenge at Really Reasonable Ribbon! 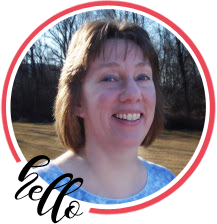 It’s time for another fun challenge at Really Reasonable Ribbon’s Ramblings today. The theme is Buttons & Bows. I have two samples this time around. 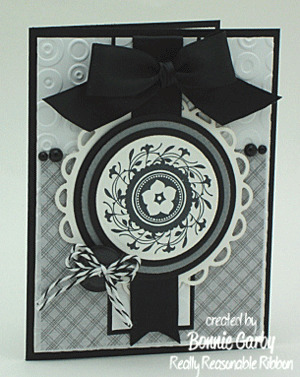 First I made a card with one of my favorite color combo’s – black and white. I just love the great contrast when you go with a basic black and white color theme. Next I have a quick little set of bows on snap clips. These were very quick and easy to make up. I covered my 50mm snap clips with 1/4″ white grosgrain and I made the bows with my Bow Easy Tool using 7/8″ pink gingham. Once the bows were done, I trimmed off the tail so it would not show. I threaded a flower shaped brad though my botton holes and secured the brad to the button. Then I glued the button to the bow and attached the bow to the snap clip. This is a good project to use some of your shorter lengths of ribbon. Thanks so much for stopping by today. I hope you’re inspired to join in our challenge this time around. You have until 4-12 to link up your Buttons & Bows project.